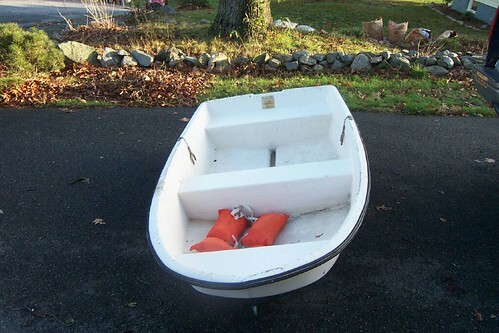 ← Oh rowboat, rowboat, wherefore art thou, little rowboat? No name for our rowboat, just calling it “the dinghy” or “the rowboat” will suffice. 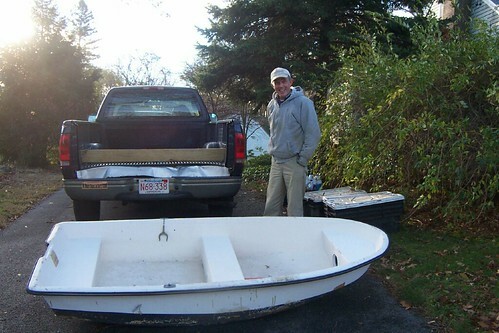 (Note: Paul says there is a name painted on the back of the rowboat, it’s called “The Plug” whatever THAT means! I said we should rename it to “The Dingh-Bat”. As you can see, it needs a little TLC. Paul took it out on the water this morning so he could get out to his big boat and apparently the rowboat has a leak. Natch. He didn’t sink or anything like that, but he knows where the leak is, so he can set about fixing it. He has other little things to do to it, as well. A place to tie it up with a pull-line, for instance. It’s quite cold here today and he’s been in and out working on that all morning. So we’re progressing. 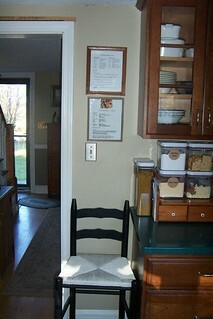 On the interior, we have some new (old) kitchen stools to report on. They came from his folks’ place and they were almost put out for the trashmen, but I rescued them in time. I only had one step-stool before that I could sit on whilst cooking dinners but now I have two, which means I can have a friend over and we can sit in my kitchen together if we want. Paul thinks I’m stupid for wanting the two there, but they are staying put. I love them. Much more comfortable to sit on, as well. Stuff is going on out back today. A tree service pulled into the driveway behind our property and is systematically taking down a tree in the woods. Our neighbor must have sweated out the hurricane thinking that tree would fall onto his garage, so he’s having the tree either seriously trimmed or taken down altogether. Paul thinks the whole thing will be gone today. There are other trees back there that I wish someone would cut down, as well. We all sweated it out during the hurricane, praying none of them would fall on our houses or garage. 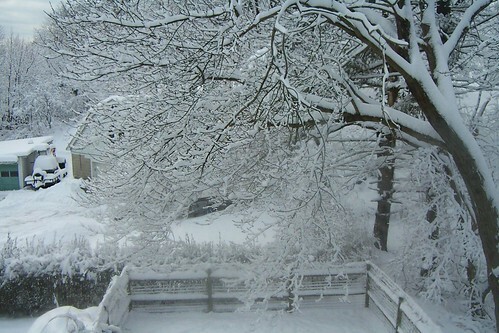 The photo above was taken in January 2009 showing the back wooded area and my neighbor’s garage. Sorry I don’t have a more clear view of this spot. So after today, some of those trees will be history. Did I show you the tree that DID fall next door to our property? That fell over in the hurricane. I heard it and saw it seconds after it fell but it only went into the garden next door, luckily not on any homes. And I’ll leave you with an old picture I found of the late, great Muffin Collieflower, our first collie together. She was 6 when we adopted her from the Collie Rescue Network and we had her for about 4 years before she died from cancer of the nose. She was the best girl collie dog ever! 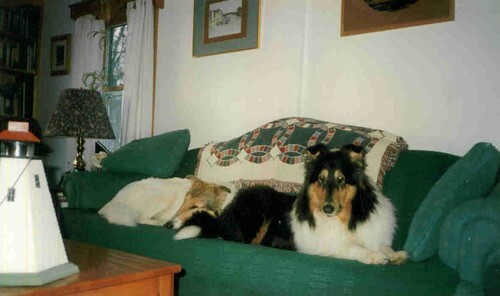 Muff was a tricolor collie and Jazzy was a white with sable head collie girl. This picture, as it happened, was taken of her sitting outside on her last day of life. The following day she passed on and it was one of saddest days of our lives. I love her still to this day so much. My pets show up in my dreams a lot, too, Sil. Re: the boat – when Paul was coming in from his big boat yesterday, he looked down in the water in the cove and spotted his old rowboat sitting on the bottom sunk. He will wait til Mon. or Tues. at low tide and see if he can pull it up then. So he thinks he can salvage it…I hope. SO Glad Paul could get another dinghy so soon. It’s an essential tool for him, I’m sure. Dear dogs who have passed on, I have so many good memories. 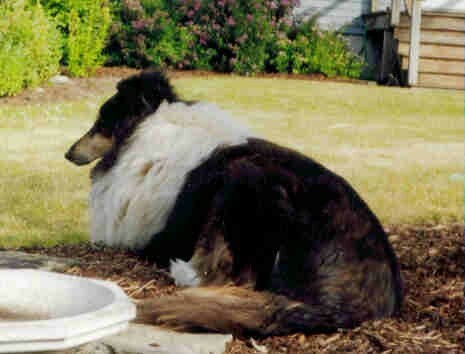 Shawn, who passed in 1985, aged 14, was half collie/half shepherd. He still shows up in my dreams frequently with his big doggy smile and romping ways. Glad to hear Paul has the new boat sorted out. I didn’t realize all the work entailed in just a dinghy. I love the photos of the pups. You have had some really good looking dogs in your life time. And the stools are delightful. I loved every min with the fuzzies…yes you gave up your bed for me and even has treats in the top drawer for me (fun stuff). I didn’t want people to think I made you sleep with the dogs on the sofa, Sandy!!! 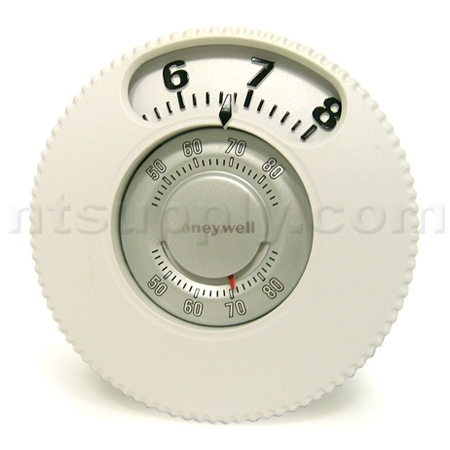 Stay warm, stay safe. Glad to see all is coming back together for you. I too miss jazz…I remember sleeping on the sofa with them both. Hey…I would love to sit on the new stools and watch you do a good cooking show for me …everything you make is great looking. yes, the good old days… I don’t miss all the typing though! Keep the stepstool seat warm for me. I’ll be over soon to give it its inaugural sitting. Is it okay if I sit and watch while you do some cooking? Watching people work is so much fun. Remember when you would come over to the office and say “keep on working, I’m just sitting here resting.” Those were the good old days when we were the only sailors who kept that boat afloat-to use a rowboat metaphor. 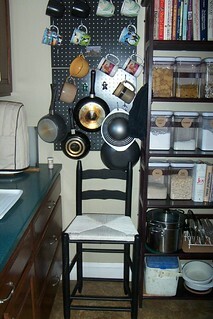 I put the “stepstool” in the eating area, these are just for sitting on, and no junk is allowed on them. I’m glad you were able to replace the boat that disappeared.